Background: Malnutrition is a common problem in hospitalized patients, increasing the risk of postoperative complications. 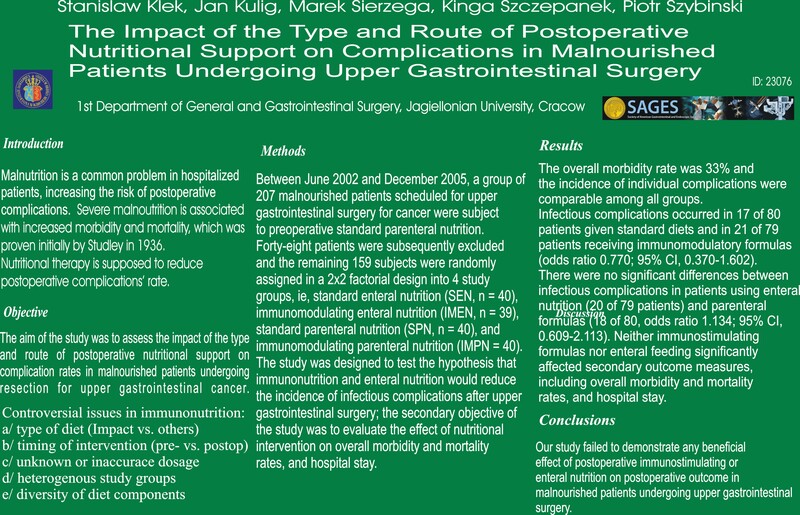 The aim of the study was to assess the impact of the type and route of postoperative nutritional support on complication rates in malnourished patients undergoing resection for upper gastrointestinal cancer. Material and Methods: Between June 2002 and December 2005, a group of 207 malnourished patients scheduled for upper gastrointestinal surgery for cancer were subject to preoperative standard parenteral nutrition. Forty-eight patients were subsequently excluded and the remaining 159 subjects were randomly assigned in a 2×2 factorial design into 4 study groups, ie, standard enteral nutrition (SEN, n = 40), immunomodulating enteral nutrition (IMEN, n = 39), standard parenteral nutrition (SPN, n = 40), and immunomodulating parenteral nutrition (IMPN = 40). The study was designed to test the hypothesis that immunonutrition and enteral nutrition would reduce the incidence of infectious complications after upper gastrointestinal surgery; the secondary objective of the study was to evaluate the effect of nutritional intervention on overall morbidity and mortality rates, and hospital stay. RESULTS: The overall morbidity rate was 33% and the incidence of individual complications was comparable between all groups. Infectious complications occurred in 17 of 80 patients given standard diets and in 21 of 79 patients receiving immunomodulatory formulas (odds ratio 0.770; 95% CI, 0.370-1.602). There were no significant differences between infectious complications in patients using enteral nutrition (20 of 79 patients) and parenteral formulas (18 of 80, odds ratio 1.134; 95% CI, 0.609-2.113). Neither immunostimulating formulas nor enteral feeding significantly affected secondary outcome measures, including overall morbidity and mortality rates, and hospital stay. CONCLUSIONS: Our study failed to demonstrate any beneficial effects of postoperative immunostimulating or enteral nutrition on postoperative outcome in malnourished patients undergoing upper gastrointestinal surgery.